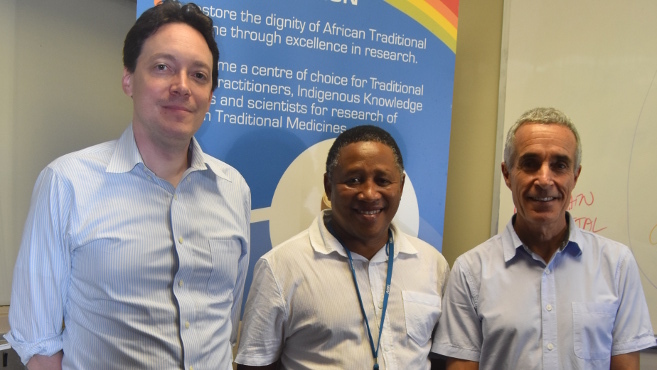 KwaZulu-Natal’s Traditional Medicine Laboratory, under the leadership of Professor Nceba Gqaleni, hosted two health scientists from Canada, Drs Ian Tietjen and Malcolm Steinberg, members of the Faculty of Health Sciences at Simon Fraser University in Vancouver, Canada. Tietjen and Steinberg have an interest in working with traditional healers, their patients and their communities in mutually-beneficial and respectful collaborations to better understand and improve healthcare. While on his visit, he presented a talk titled Natural Product-derived Compounds and Traditional Medicines in Traditional Medicine Academic HIV suppression, Remission and Cure Strategies. According to Tietjen, while combination antiretroviral therapy (cART) has significantly reduced HIV morbidity and mortality worldwide, virus persists within cellular reservoirs that continue to produce infectious virus. ‘As a result, cART must be maintained for life. To achieve durable, cART-free HIV remission (or ultimately an HIV cure), two opposing therapeutic strategies are proposed: reservoir elimination and reservoir containment,’ said Tietjen. He said the former uses latency reversal agents (LRAs) to ‘activate’ HIV reservoirs, which are then eliminated naturally or therapeutically, while the latter involves pro-latency agents (PLAs) that permanently maintain HIV reservoirs in a dormant state. ‘We anticipate that results of this research will expand our knowledge of HIV reservoirs and have the potential to identify new therapeutic strategies to durably suppress or perhaps cure HIV,’ he said. Tietjen and Steinberg welcome questions, discussions, and collaborations with members of the UKZN community and beyond. They can be reached at itietjen@sfu.ca and malcolm_steinberg@sfu.ca, respectively.